Major philanthropic gifts by Chinese Americans have surged nearly fivefold to almost $500 million in recent years, with most of the money going to higher education, a new study has found. Philanthropy by donors in China also soared as the nation’s roaring economy produced more billionaires than in the United States and helped fuel a 430% increase in a decade in the number of registered charitable foundations in China — 5,545 in 2016, the study reported. In 2014, Chinese philanthropic giving reached $16.7 billion. “Chinese and Chinese American Philanthropy” is the first academic effort to examine the size, motivation and impact of giving by Chinese and Chinese Americans in the United States and China. The research, by the UCLA Luskin School of Public Affairs, the Long U.S.-China Institute at UC Irvine and the nonprofit Asian Americans Advancing Justice-Los Angeles, was released Wednesday. “Major contributions by Chinese and Chinese American philanthropists are having a dramatic and positive effect — widening access to higher education, advancing innovations in health research and science and supporting the arts and culture,” Stewart Kwoh, president of Asian Americans Advancing Justice-L.A., said in a statement. John Long, a global real estate investor whose family foundation established the Long U.S.-China Institute in 2010, said he was troubled by what he called public perceptions that Chinese and Chinese Americans were not sufficiently giving back to the United States. He said he encounters criticism, for instance, that Chinese Americans don’t participate enough in United Way fundraising campaigns and that the University of California accepts too many Asian students. The study examined donors of Chinese descent in the United States, China, Hong Kong, Taiwan and Macau who gave an average of at least $1 million in three individual years between 2008 and 2014. Researchers profiled 35 Chinese and 29 Chinese Americans to look at their motivations for giving and the effect they had. Long, a UCLA graduate who immigrated to the United States from southern China at age 6, and his wife, Marilyn, who was born in Salinas, Calif., said they were inspired to share their wealth by their Christian faith and the example of other philanthropists such as Eli Broad. The Longs donated $2 million to UCLA to start a real estate research center in 2000 and more than $6 million to UC Irvine to launch the Long U.S.-China Institute in 2010. “The UC definitely shaped my life and gave me opportunities that I wouldn’t have had otherwise,” John Long said. Shirley and Walter Wang, who both lived in Taiwan when they were young, made their mint manufacturing plastic pipes and fiberglass doors. They said their giving was inspired by their Christian faith and the example of their family elders. Shirley Wang, a UCLA graduate, is the first Asian American to head the UCLA Foundation and donated $1 million to the campus for middle-class scholarships last year. The Wangs estimated they gave between $20 million and $30 million over the last 15 years, mostly to enhance education, public health and the environment in the United States, Africa and Asia. The couple donated 400 miles of plastic pipes, for instance, to bring water to 350,000 people in eight African countries. In addition to funding scholarships, they have given money to UCLA for educational films about Chinese Americans, travel abroad and computer science programs. “In the last 20 years, more Asians have become more well-to-do and they finally have the ability to give,” Walter Wang said. Ming Hsieh, who pioneered technology in fingerprint identification, survived China's tumultuous Cultural Revolution and landed at USC in 1980, earning a bachelor’s and a master’s degree in electrical engineering. He said he didn’t know about philanthropy when he got to campus — but learned that USC buildings were named after people who had donated to the campus. Hsieh gave $35 million in 2006 to the USC electrical engineering department and $50 million in 2010 to establish and endow an institute in nanomedicine to develop new cancer therapies. His total giving since 2006 tops $100 million, with gifts to other universities, schools, museums and hospitals. But his first priority has been USC, where he serves as a trustee. I wanted to give back to the place where I got my knowledge and help the next generation live longer, healthier lives in a better environment. The number of Chinese American foundations in the United States grew 418%, to nearly 1,300, from 2000 to 2014. More than 80% of the foundations have been established since 2000. About 66% of the gifts between 2008 and 2014 went to higher education. In the United States, private universities such as Harvard, USC and Stanford received most of the major donations. But in 2017, Chinese Americans gave more than $50 million in major gifts to UC Berkeley, UC San Francisco, UCLA and UC Irvine, Kwoh said. Gifts from Chinese Americans accounted for 1.2% of all major U.S. philanthropic gifts between 2008 and 2014. That percentage was roughly proportional to their population of about 4 million. Kwoh said he hoped the study and a new website on Chinese philanthropy would encourage more giving. “It’s important not only to recognize this philanthropy but also to tap this energy and interest to benefit this country and its many communities,” Kwoh said. Chinese migration to the United States is a history of two parts: a first wave from the 1850s to 1880s, halted by federal laws restricting Chinese immigration; and a second wave from the late 1970s to the present, following normalization of U.S.-Chinese relations and changes to U.S. and Chinese migration policies. Chinese immigrants are now the third-largest foreign-born group in the United States after Mexicans and Indians, numbering more than 2 million and comprising 5 percent of the overall immigrant population in 2013. From the 1850s, political unrest and economic pressures at home prompted thousands of Chinese immigrants to move to the western regions of the United States in search of temporary work. Many took low-skilled jobs as manual laborers in mining, construction, agriculture, manufacturing, or service industries. The 1890 decennial census reports a Chinese-born resident population exceeding 100,000; records show that nearly 300,000 Chinese immigrants entered the United States between 1850 and 1889, though historians estimate that as many as half ultimately returned to China. This wave of Chinese migration was accompanied by growing anti-Chinese sentiment and ethnic discrimination, culminating in the U.S. Congress passing the Chinese Exclusion Act in 1882. The law prohibited Chinese labor migration to the United States and barred Chinese residents from obtaining U.S. citizenship. Though the law was repealed in 1943, little Chinese immigration was permitted until the Immigration and Nationality Act of 1965 overhauled the U.S. immigration system and significantly expanded migration opportunities for non-European immigrants. Though Hong Kong nationals started moving to the United States in the late 1960s—by 1980, there were 85,000 Hong Kong-born immigrants in the United States, and today, immigrants from Hong Kong account for about one in 10 Chinese immigrants—large-scale immigration from mainland China only resumed after the People’s Republic of China opened its economy to global markets and lifted migration restrictions in 1978. The number of immigrants from mainland China in the United States nearly doubled from 299,000 in 1980 to 536,000 in 1990. Unlike the 19th century immigrants, post-1965 Chinese immigrants are predominantly skilled: China is now the principal source of foreign students in U.S. higher education, and the second-largest recipient of employer-sponsored temporary work visas, after India. Sources: Data from U.S. Census Bureau 2006, 2010, and 2013 American Community Surveys (ACS), and 1980, 1990, and 2000 Decennial Census. Approximately one-quarter of all Chinese emigrants settle in the United States, with other popular destinations including Canada (896,000), South Korea (657,000), Japan (655,000), Australia (547,000), and Singapore (457,000), according to mid-2013 estimates by the United Nations Population Division. Click here to view an interactive map showing where migrants from China and other countries have settled worldwide. Around half of Chinese immigrants obtain lawful permanent residence in the United States (also known as receiving a “green card”) through family channels. The remainder qualifies through employment-based preferences, or asylee status. Compared to the overall foreign- and native-born populations, Chinese immigrants are more highly educated, more likely to be employed, and have a higher household income. The terms foreign born and immigrant are used interchangeably and refer to those who were born in another country and later emigrated to the United States. Data collection constraints do not permit inclusion of those who gained Chinese citizenship via naturalization and later moved to the United States. Unless otherwise stated, estimates for China include Hong Kong and exclude Taiwan. Using data from the U.S. Census Bureau (the most recent 2013 American Community Survey [ACS] as well as pooled 2009-13 ACS data), the Department of Homeland Security’s Yearbook of Immigration Statistics, and the World Bank's annual remittance data, this Spotlight provides information on the Chinese immigrant population in the United States, focusing on its size, geographic distribution, and socioeconomic characteristics. 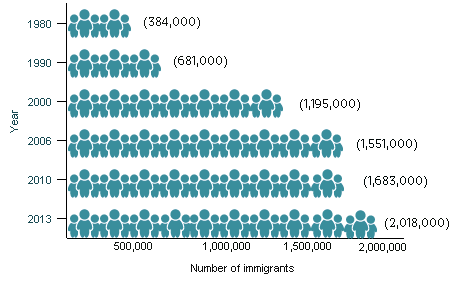 Source: Migration Policy Institute (MPI) tabulation of data from U.S. Census Bureau pooled 2009-13 ACS. Click here for an interactive map that shows the geographic distribution of immigrants by state and county. Select China from the dropdown menu to see which states and counties have the most Chinese immigrants. In the 2009-13 period, the U.S. cities with the largest number of Chinese immigrants were the greater New York City, San Francisco, and Los Angeles metropolitan areas. 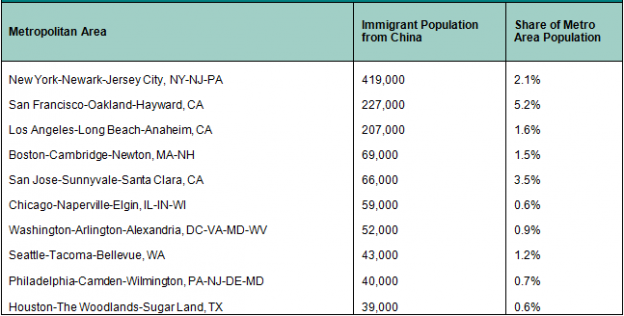 These three metropolitan areas accounted for about 46 percent of Chinese immigrants in the United States. Source: MPI tabulation of data from U.S. Census Bureau pooled 2009-13 ACS. 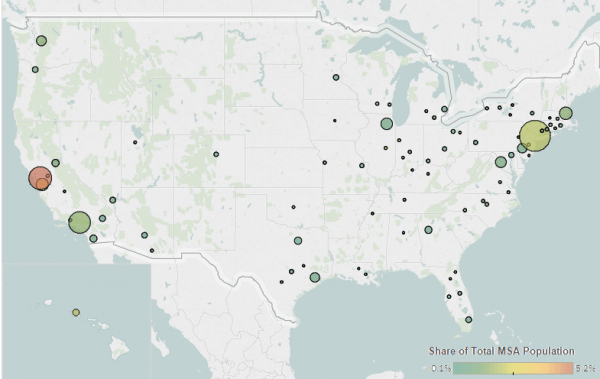 Click here for an interactive map that highlights the metropolitan areas with the highest concentrations of immigrants. Select China from the dropdown menu to see which metropolitan areas have the most Chinese immigrants. Chinese immigrants were less likely to be proficient in English and speak English at home than the overall U.S. foreign-born population. In 2013, about 62 percent of Chinese immigrants (ages 5 and over) reported limited English proficiency, compared to 50 percent of the total foreign-born population. Approximately 10 percent of Chinese immigrants spoke only English at home, versus 16 percent of all immigrants. As of 2013, there were approximately 213,000 Hong Kong-born Chinese immigrants in the United States. 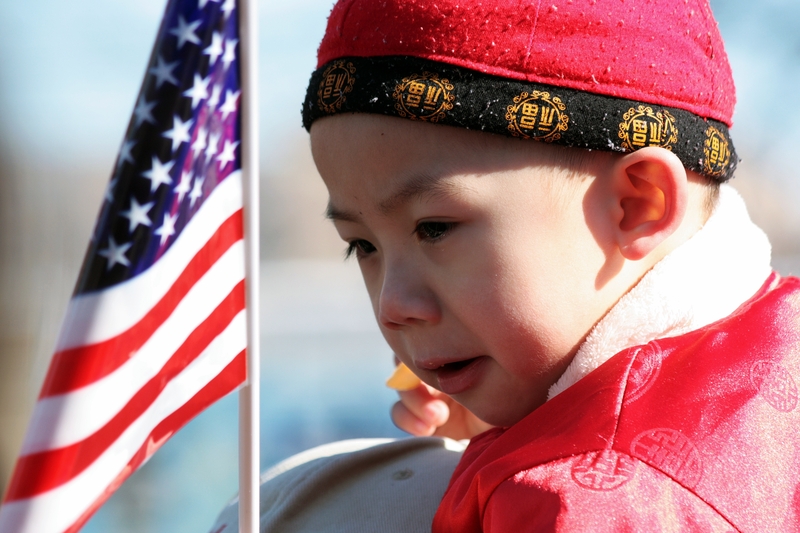 Most Hong Kong-born immigrants arrived before 2000, and 82 percent have become U.S. citizens. The immigrant population from Hong Kong has a median age of 49. Eighty-nine percent of this population is of working age, with 9 percent aged 65 or over, and 2 percent under 18. Families headed by a Hong Kong-born immigrant reported a median household income of $89,600, compared to $48,000 for foreign-born families in the United States. Less than 10 percent of immigrants from Hong Kong live in poverty. Chinese immigrants tend to have much higher educational attainment compared to the overall foreign- and native-born populations. In 2013, 47 percent of Chinese immigrants (ages 25 and over) had a bachelor’s degree or higher, compared to 28 percent of the total immigrant population and 30 percent of the native-born population. The Chinese immigrant population was older than both the overall foreign- and native-born populations. The median age of Chinese immigrants was 45 years—compared to 43 for the foreign-born population overall and 36 for the native-born population. In 2013, 76 percent of Chinese immigrants were of working age (18 to 64), 17 percent were ages 65 and over, and 7 percent were under 18. In comparison, 80 percent of all foreign born in the United States were of working age, 14 percent were 65 and over, and 6 percent were under 18. Meanwhile, 60 percent of the native-born population was of working age, 14 percent was 65 and over, and 26 percent was under 18. Chinese immigrants participated in the labor force at a slightly lower rate than the overall immigrant and native-born populations. In 2013, about 59 percent of Chinese immigrants ages 16 and over were in the civilian labor force, compared to 67 percent and 63 percent of the total foreign- and native-born populations, respectively. 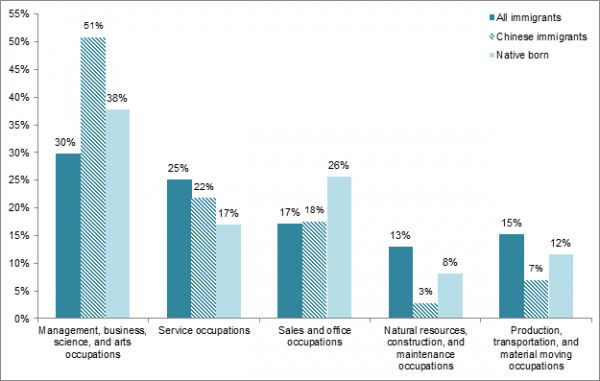 Chinese immigrants were much more likely to be employed in management, business, science, and arts occupations (51 percent) compared to the other two groups. Chinese immigrants had much higher incomes compared to the total foreign- and native-born populations. In 2013, the median income of households headed by a Chinese immigrant was $57,000, compared to $48,000 and $53,000 for overall immigrant and native-born households, respectively. In 2013, 19 percent of Chinese immigrants lived in poverty, a rate similar to all immigrants but slightly higher than the 15 percent posted by the native-born population. In 2013, 54 percent of the approximately 2.01 million Chinese immigrants residing in the United States were naturalized U.S. citizens, compared with 47 percent of the overall foreign-born population. Chinese immigrants are more likely to have entered the United States more recently than the overall immigrant population, as Figure 5 shows. More than half of Chinese immigrants (53 percent) arrived prior to 2000, followed by 30 percent who arrived between 2000 and 2009, and 17 percent in 2010 or later. 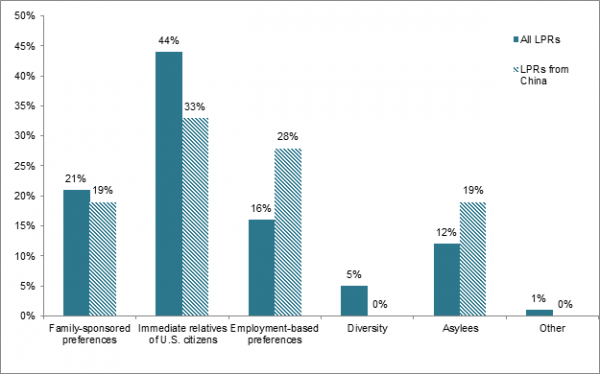 In 2013, Chinese immigrants were more likely to become lawful permanent residents (LPRs) via employment pathways (28 percent) than the overall LPR population (16 percent). Chinese immigrants were less likely than the overall LPR population to gain green cards as immediate relatives of U.S. citizens (33 percent, compared with 44 percent), or through family-sponsored preferences (19 percent, compared with 21 percent). Although no Chinese nationals arrive in the United States as refugees, China is the leading country of U.S. asylum applicants—34 percent of the 25,200 individuals granted asylum in fiscal year (FY) 2013 were from China. Also, Chinese immigrants were more likely to obtain a green card adjusting from an asylee status (19 percent) compared to the total LPR population (12 percent). Notes: Family-sponsored: Includes adult children and siblings of U.S. citizens as well as spouses and children of green-card holders.Immediate relatives of U.S. citizens: Includes spouses, minor children, and parents of U.S. citizens. Diversity Visa Lottery: The Immigration Act of 1990 established the Diversity Visa Lottery to allow entry to immigrants from countries with low rates of immigration to the United States. The law states that 55,000 diversity visas are made available each fiscal year. Nationals of the People’s Republic of China are ineligible to participate in the DV Lottery. As of January 2012, there were approximately 210,000 unauthorized Chinese nationals living in the United States, comprising nearly 2 percent of the 11.4 million unauthorized immigrants in the United States. Around 12,000 Chinese youth were eligible for the Deferred Action for Childhood Arrivals (DACA) program as of March 31, 2014, according to MPI estimates, yet very few applied for DACA in the first two years of the program. Advocates suggest the low application rate in the Chinese immigrant community may stem from factors including limited outreach, cultural inhibitions, fear of disclosing their unauthorized status, and language barriers. Chinese immigrants were much less likely to be uninsured (18 percent) compared to the overall immigrant population (32 percent), but more likely to be uninsured than the native-born population (12 percent). Chinese immigrants were more likely to have private health insurance than the total foreign-born population, though their insurance levels were still below those of the native-born population. The Chinese diaspora population in the United States is comprised of approximately 4.4 million individuals who were either born in the People’s Republic of China, Hong Kong, Macau, or Taiwan, or reported Chinese or Taiwanese ancestry or race, according to tabulations from the U.S. Census Bureau pooled 2009-13 ACS. Global remittances sent to China via formal channels equaled nearly $60 billion in 2013, though this represented less than 1 percent of the country’s gross domestic product (GDP), according to data from the World Bank. Remittances sent to China have seen a 67-fold increase since 1995. Hutchinson, Edward P. Legislative History of American Immigration Policy 1798-1965. Philadelphia: University of Pennsylvania Press, 1981. Institute of International Education. 2014. Open Doors 2014. Washington, DC: Institute of International Education. Martin, Daniel C., and James E. Yankay. 2014. Refugees and Asylees: 2013. Annual Flow Report, August 2014. Washington, DC: DHS Office of Immigration Statistics. Available Online. Semple, Kirk. 2013. Advocates Struggle to Reach Immigrants Eligible for Deferred Action. New York Times, December 8, 2013. Available Online. United Nations Population Division. 2013. International migrant stock by destination and origin. Available Online. ---. 2010. 2008-2012 ACS. Accessed from Steven Ruggles, J. Trent Alexander, Katie Genadek, Ronald Goeken, Matthew B. Schroeder, and Matthew Sobek. Integrated Public Use Microdata Series: Version 5.0 [Machine-readable database]. Minneapolis: University of Minnesota, 2010. Available Online. United States Citizenship and Immigration Services (USCIS). Citizenship Through Naturalization. Last updated January 22, 2013. Available Online. U.S. Department of State, Bureau of Consular Affairs. Nonimmigrant Visa Issuances by Visa Class and by Nationality, FY2013. Available Online. Yang, Philip Q. 2000. The “Sojourner Hypothesis” Revisited. Diaspora: A Journal of Transnational Studies 9(2): 235-58.